I am very inexperienced with mathematics and expression data. I have developed a pipeline for WGCNA, practicing with gene-expression microarray data. I am now determined to try to apply this strategy to microbial-communities count data. Some correlations are NA in block 1 : 790 . Contrasting this plot with that of a typical plot from the 'voom' paper (https://genomebiology.biomedcentral.com/articles/10.1186/gb-2014-15-2-r29) indicates that this output is not valid- given that the data is so sparse. How can I convert such a sparse count data frame to a validly continuous one? 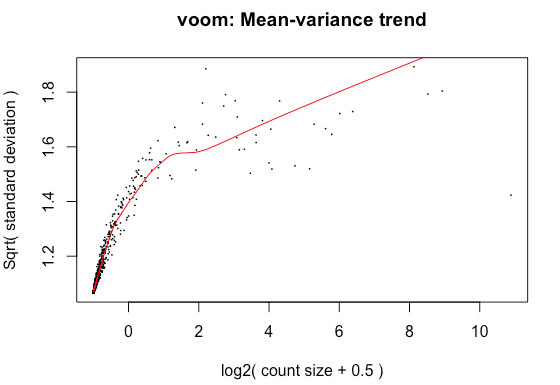 voom is designed for RNA-seq data. There is no reason to think it would work well for microbial counts, and this has little to do with sparseness. voom is also incompatible with WGCNA, because WGCNA can't use the voom weights (which are the whole point of voom).